Wightwick Bridge No 57 is a minor waterways place minor waterways place place on the waterways major waterways place village town city on the Staffordshire and Worcestershire Canal (Main Line: Stourton to Aldersley) between Wombourne Bridge No 43 (4 miles and 6¼ furlongs and 7 locks to the south) and Aldersley Junction (Junction of the Staffordshire and Worcestershire Canal Main Line with the Birmingham Canal Navigations Main Line) (2 miles and 5¾ furlongs and 3 locks to the northeast). The nearest place in the direction of Wombourne Bridge No 43 is Wightwick Bridge No 56; 1 furlong away. 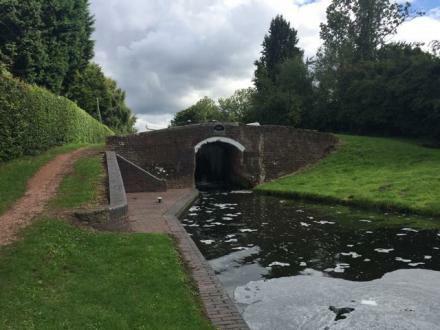 The nearest place in the direction of Aldersley Junction is Wightwick Lock No 29; a few yards away. Bridgnorth Rd, Wolverhampton, WV6 8BN — 257 yards to the west. 62 Ennerdale Dr, Wolverhampton, WV67PF — 1486 yards to the northwest. Wolverhampton — 1217 yards to the north. Wolverhampton — 1465 yards to the east. Wightwick Manor, Wightwick bank, Wolverhampton, WV6 8EE — 361 yards to the west. The stockings farm, Wolverhampton — 1385 yards to the southeast. Mount Rd, Wolverhampton, WV6 8HL — 654 yards to the northeast. 54 Woodland Avenue, Wolverhampton, WV6 8NE — 1241 yards to the northeast. 7 Rowton Avenue, Wolverhampton, WV6 7SR — 1432 yards to the northwest. London — 1241 yards to the northeast. Wolverhampton — 1432 yards to the southeast. Wolverhampton — 1496 yards to the north. Wolverhampton — 1634 yards to the southeast. Castlecroft Road, Wolverhampton, WV3 8NA — 1065 yards to the south. Wolverhampton — 1280 yards to the southeast. 229 castlecroft road, Wolverhampton, WV3 8NA — 688 yards to the south. Paxton Avenue, Wolverhampton, WV6 7SG — 1502 yards to the northwest. Wolverhampton — 1442 yards to the southeast. Wolverhampton — 1367 yards to the northwest. Mount Road,Tettenhall Wood, Wolverhampton, WV6 8HL — 675 yards to the northeast. Wolverhampton, WV6 — 1324 yards to the northwest. Windmill Crescent, Wolverhampton, WV3 8HU — 409 yards to the southeast. Wolverhampton — 1287 yards to the northwest. Wolverhampton — 1508 yards to the northeast. 5 Viewlands Drive, Wolverhampton, WV68 — 199 yards to the north. 1 Finchfield Road West, Wolverhampton, WV3 8AY — 1345 yards to the east. Wolverhampton — 1467 yards to the east. 26 Finchfield Road West, Finchfield,, Wolverhampton, WV3 8AZ — 1367 yards to the east. Wolverhampton, WV6 8 — 1070 yards to the north. Wolverhampton, WV6 7 — 1594 yards to the northwest. 21 School Road, Wolverhampton, WV6 8EN — 1091 yards to the northeast. Ounsdale Road, Wolverhampton, WV5 8BH — 885 yards to the southeast. Tettenhall — 1246 yards to the north. Castlecroft Stadium, Wolverhampton, WV3 8 — 931 yards to the south. Wolverhampton, WV3 8 — 323 yards to the southeast. Wolverhampton — 1385 yards to the southeast. The Gym, Wolverhampton, WV3 0TE — 1157 yards to the southeast.